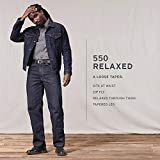 Levi's Jeans 550 Relaxed Fit are go-to jeans for country boys and city guys Jeans sit comfortably below natural waist. Button waist and zipper fly. Authentic five-pocket styling. Quality construction includes topstitching on hip seams and back pockets. Imported. 06 - Stonewash is made of 13. 75 oz. cotton denim. C1 - Black Out is made of 13. 5 oz. cotton denim. M9 - Rinsed is made of 14. 5 oz. cotton denim. L7 - Dark Stone is made of 13. 5oz. cotton denim. As an authorized U. S. retailer of Levi Strauss and Co. products, we cannot accept orders from outside the United States for Levi's products. Interested in the Levi's Men's 550 Relaxed-fit Jean, Dark Stonewash, 38X32? Is the price too high? You can easily price watch this product and we'll notify you when the price reaches your target.